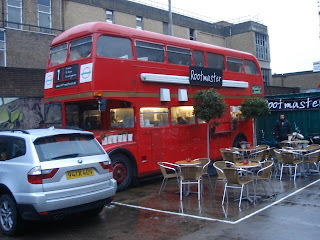 This old Routemaster, parked in a corner a car park off Brick Lane, has been converted into a restaurant (a vegan restaurant, hence the groan-inducing pun in the name), kitchen downstairs, dining space upstairs (and outside, when the weather's more clement). As far as I know, it's the only such example in London; you'd think there'd be more. Not a restuarant, but there's the Camden Bus Estate agent, just off Parkway.